It can't be easy working for cage-rattler Carl Icahn, but Meister, one of Icahn's top lieutenants, seems to have figured it out. The Harvard-educated son of a high-ranking Aon executive worked as an analyst at Lazard and then at private equity's Northstar Capital before hooking up with Icahn. 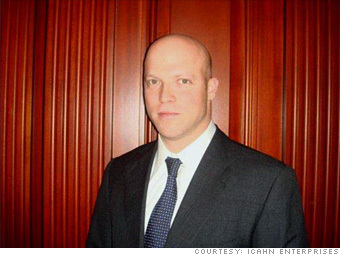 Now he's one of his top prospectors and manages his $3 billion hedge fund. He's starting to come out from his boss's long shadow: He sits on the board of Motorola and several other portfolio companies. Tabloid pedigree: Meister's brother, Todd, was married to socialite Nicky Hilton briefly in 2004. Note: To be eligible for Fortune's 40 under 40, candidates had to be 39 or younger on Nov. 1, 2009. List compiled by Alyssa Abkowitz, Maha Atal, Katie Benner, Scott Cendrowski, Lawrence Delevigne, Telis Demos, Jessi Hempel, Suzanne Kapner, Mina Kimes, Beth Kowitt, Jessica Shambora, Richard Siklos, Kim Thai, Christopher Tkaczyk and Jia Lynn Yang. Research by Marilyn Adamo and Doris Burke.